Global Nitrocellulose Market size was over USD 550 million in 2015, and is set to grow at CAGR exceeding 6.5% by 2023. Growing ecommerce industry and increased spending on lifestyle products has aided the furniture industry especially in growing economies. Customer inclination towards online shopping which accounts for considerable share of furniture sales will fuel nitrocellulose market growth. Stringent regulations by FDA and EU such as 67/54/EEC along with transport regulation such as UN 2555 and UN 2556 leads increase in cost of operations in this industry, which may affect price trend of global nitrocellulose market during the forecast timeframe.Growth of printing applications across end use industries like print media and packaging has led to growth of global nitrocellulose market. Nitrocellulose is a highly inflammable compound and a derivative of natural cellulose either in the form of cotton linters or wood pulp. It is the main component of smokeless gunpowder with nitrogen content in the range of approximately 13%. Other products include A grade and AM grade with nitrogen content ranging between 11% and 13%. Strong growth of the cosmetic industry across the globe is expected to boost nitrocellulose market demand. However, in nail paints require very close monitoring and controlling levels of moisture and acidity which leads to additional cost for nail paint manufacturer hampering the market growth. Gravure and flexographic printing inks in the packaging industry utilizes nitrocellulose as a key component as it provides gloss, has fast drying capacity and good adhesion to many substrates. Printing inks application segment was the leading consumer and accounted for more than 25% of the global nitrocellulose market share in 2014. This can be attributed to its properties like ability of quick drying, strong adhesion to the materials and less reactive to additives. Automotive paints market application accounted for more than 20% of global market consumption in 2015 and will grow at CAGR exceeding 4.5% during the forecast timeframe. Wood coatings applications consumption in the U.S. was over six kilo tons 2015 and is set to attain growth rate at over 5.2% up to 2023. 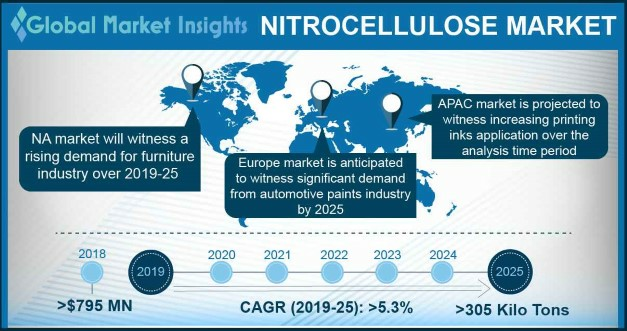 Strong demand from furniture industry will act as key industry trend driving the U.S. nitrocellulose market. Additionally, nitrocellulose based wood coatings can be utilized with other color applications like wiping stains, toners and glazes. They can easily be repaired throughout the finishing process. It also enables easy rubbing and polishing of the coated material. North America nitrocellulose market dominated by U.S is anticipated to witness gains over 5% during the forecast timeframe. U.S. market will be driven by printing ink applications segment during the forecast timeframe. APAC countries will be driven by India, Indonesia, Vietnam and Thailand owing to growth of leather manufacturing. Nitrocellulose is utilized in manufacturing leather accessories like offers like shoes, belts, seat cover (leather tanneries in Vietnam) for improving their flexibility. India leather manufacturing applications segment of nitrocellulose market is anticipated to grow at CAGR exceeding 6.5% during the forecast period. Europe nitrocellulose market is anticipated to witness CAGR over 4.5% during the forecast timeframe. Market will be driven by Germany and France and together these countries are expected to be worth more than 85 million by 2023. MEA nitrocellulose market will be driven by Saudi Arabia, and UAE, and will witness sluggish gains, whereas Central & South America, dominated by Brazil are set to grow significantly at CAGR over 6% during the forecast timeframe. Brazil market demand can be attributed to increasing industrial production of country where largest expansion is seen in motor vehicles and trailer category. Global nitrocellulose market is fragmented with large number of players operating in unorganized sector. The Dow chemicals, SNPE, TNC Industrial Co., Nitro Chemicals Industries, Baoding Baofeng, Hebei Beixin, Nitro Quimica, Sichuan Nitro cell Co. Ltd. Eurenco are some of the key players across the globe. Major market players are focused on expanding their offerings supported by extensive product research and development. Major industry participants are focused on bringing new technologies to make the production process cleaner. Key raw materials used in production include nitric acid, cotton linters, wood pulp and sulfuric acid. Raw material procurement is a major issue for manufacturers owing to scarcity of supply in the market. A typical manufacturing process includes raw material preparation, continuous nitration, separation, stabilization and refining. It may also include acids recovery, water treatment and fumes absorption. Companies are trying to increase their production efficiency to cater to the rising global demand. The global cellulose fiber market size was valued at USD 20 billion in 2015. Nitrocellulose is produced through the reaction with nitrating acid and it forms a part of cellulose fiber market. Other types of cellulose include viscose staple fiber (VSF), microcrystalline cellulose acetate. The market demand for the use of cellulose fiber is growing across a wide range of application and sustained growth due to the good absorbing capacity and ecofriendly nature. Nitrocellulose is highly utilized in applications such as printing ink, wood coatings, nail varnishes automotive paints, and leather finishes. Leather materials are coated with nitrocellulose induced leather finishes which guards them from heat and moisture. Other prominent end use industries include artificial jewelry and adhesives & sealants. Usage in nail paints is under regulatory pressure due to safety issues. It acts as primary film former in nail paint manufacturing. Use of nitrocellulose protects the nail and at the same time allows nails to breathe which acts as the USP of the product.